When Lexus introduced the Shimamoku wood steering wheel, it transformed a standard utilitarian car feature into an object of great beauty. Each wheel requires a staggering 38 days to produce, and its manufacturing process involves no fewer than 67 specialized stages of production, including an intensely complex layering technique refined by Lexus. 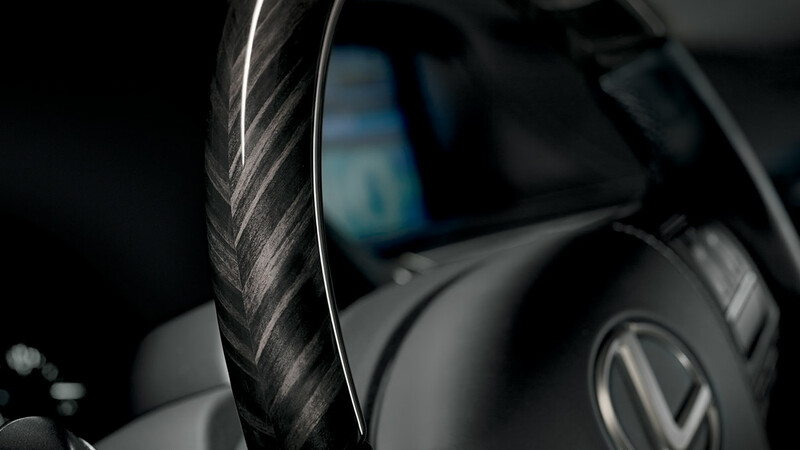 The Shimamoku steering wheel is made with sheets of Agathis wood. First the wood is layered in alternating bands of contrasting color, pressed, cured and sliced into wafer-thin sheets – a moment that brings out the magic of Shimamoku. It is then shaped to the rim of the steering wheel, sanded, polished and varnished by hand under the exacting eye of a master craftsman, before pieces of exquisite leather are hand-stitched to the wheel. Although the polishing process gives the wood a unique sheen similar to that of polished steel, the surface is also treated to avoid any potential reflection that could be distracting to drivers on the road.